There are growing calls for a global coalition of U.S. allies to pressure China to change some of its most egregious commercial practices. And I have no doubt that China's domestic market is rigged against fair competition in a way that is unique among the world's biggest economies. Barriers at the border make it hard to export into China. Competing inside China is difficult, if not impossible, without a joint venture partner, and getting all the needed approvals certainly seems easier if you agree to a certain amount of technology transfer. And even a well-connected joint venture partner doesn't always assure long-term success, particularly if the political winds change. Ask Hyundai. This isn't just based on anecdotal evidence either. Imports of manufactured goods for China's own use (manufactured imports net of the "processing trade") peaked back in 2003. Such imports are now fairly low relative to China's GDP. When it comes to manufactures, China exports, but doesn't import (much). But, well, right now those bad commercial practices are not creating all that a big a current account surplus. China's current account surplus is well below that of the Eurozone. Or that of Japan. Or those of Asia's NIEs (who are no longer that newly industrialized, but names seem to stick). After the global crisis China has limited the global impact of its rigged domestic market through a rather massive (off budget) fiscal stimulus and a big credit boom. That stimulus hasn't translated into a ton of demand for the manufactured goods produced in Japan, Europe, or the U.S. -- but it has generated a lot of demand for commodities. And the commodity exporters in turn do buy a lot of manufactures from Japan, Europe, and even the U.S. The net result is that China -- thanks to a combination of loose credit and a loose overall fiscal policy (ask the IMF!) -- puts a lot of its huge savings to work domestically. At least for now. (A bit of throat clearing. China's current account surplus is bigger than officially reported, perhaps by a percentage point of GDP. 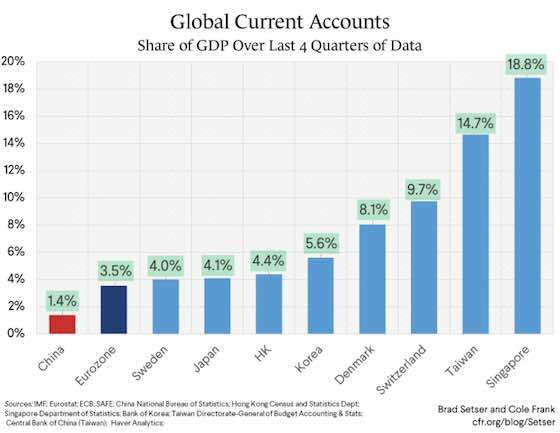 But even at 2.5 percent of China's GDP, it is smaller, relative to China's GDP than the current account surpluses of the United States' security allies. I do though worry that China's surplus may be about to head up -- export growth has been strong, and China looks intent on a bit of fiscal consolidation that will weigh on growth and imports). U.S. allies generally have much tighter fiscal policies than China. 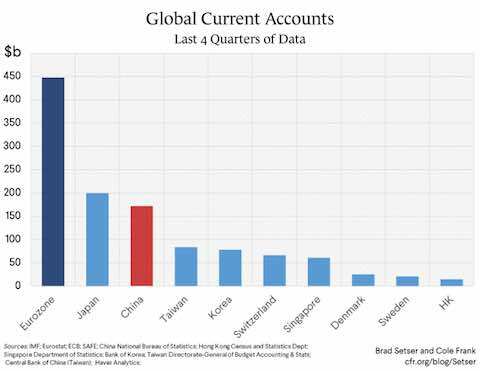 That's a big reason why they run larger current account surpluses than China. Korea and Taiwan (and neutral Switzerland) also put their finger on the foreign exchange market when needed to keep their currencies weak (Korea rather egregiously in January). 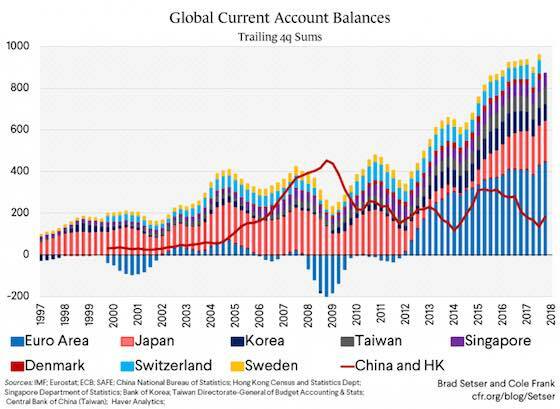 As a result, the combined current account surplus of U.S. allies in Europe and Asia is close to $800 billion -- well over China's roughly $200 billion. That sum would be a bit bigger if you added in the surplus of democratic but formally non-aligned European countries like Sweden and Switzerland. There is an important point here. The biggest surpluses globally (and for that matter, the biggest deficits) are now found in advanced economies, and the advanced economies generally have relatively low tariffs. Macroeconomic factors -- and currency levels, which themselves are shaped by macroeconomic policy choices -- play a much bigger role in determining the overall trade balance than actual trade practices. A China that behaved better commercially would no doubt help many companies. And if China lowered barriers to actual imports, overall trade with China might expand. But better commercial practices on their own aren't enough to assure a smaller Chinese trade surplus. A China that pared back on its macroeconomic stimulus as it liberalized could also provide less demand to the global economy, especially if a slowdown in China led the yuan to depreciate. Obviously this poses a bit of a dilemma for the United States. If the price of a coalition against China's commercial practices is a blind eye to macroeconomic policies in the Eurozone, Japan, Korea, and Taiwan that have raised their external surpluses, there isn't much chance the U.S. aggregate trade deficit will change. China undoubtedly contributes to the United States' aggregate deficit, but it plays a smaller role (and others in Asia play a bigger role) than its outsized bilateral surplus with the U.S suggests. And, well, the latest forecasts tend to point to rising not shrinking surpluses in many of America's biggest allies. The Eurozones's external surplus is now expected to rise toward 4.5 percent of its GDP (gulp) in the next few years. **** Higher interest income on its lending to the U.S. alone should be enough to push Japan's surplus up, even if Japan's trade surplus stabilizes. Korea has capped won appreciation at 1060 and continues to resist loosening its overly tight fiscal policy. And Taiwan's surplus shot up in the fourth quarter. This all shouldn't be a surprise. U.S. imports shot up in the fourth quarter, as did the U.S. trade deficit -- and the swing wasn't against the world's oil exporters. Globally, things usually line up. */ Back in the day there were constant calls to build a global coalition to push China to let its currency appreciate. The coalition never really materialized. Many countries wanted the U.S. to do the heavy lifting. Others were confident in their ability to intervene in their own market to protect themselves from China's undervaluation, and worried that a stronger global norm against either intervention or large external surpluses wouldn't just hit China. I expect similar divisions would appear today. **/ See the IMF's blog last year arguing that imbalances are now among the advanced economies, as both the surpluses and deficits of major emerging economies have shrunk (thanks to China's ability to keep its reported surplus under two percent of GDP; India's ability to keep its deficit under two percent of GDP; and the end of big surpluses in the oil-exporting economies). ***/ I will explicitly address whether or not the U.S. trade deficit is still too high -- and thus whether the large surpluses in many U.S. allies (and the more modest as a share of GDP but still large absolutely surplus in China) pose more than a political problem, in a later post. Suffice to say that the current trade deficit is bigger than I believe is consistent with a stable debt to GDP ratio, especially as the Fed pares back on policy accommodation and U.S. rates rise (relative to U.S. growth). ****/ There is a clear story in the financial account too: from 2014 on, fixed income investors have been fleeing low yields (and a scarcity of bunds) in the Eurozone in droves. 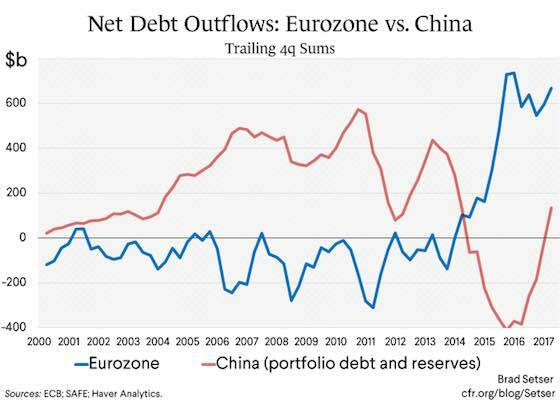 In dollar terms, net fixed income outflows from the Eurozone are bigger than the outflow associated with China's out-sized pre-crisis reserve growth (the growth in China's hidden reserves is proxied by the rise in its holdings of portfolio debt). 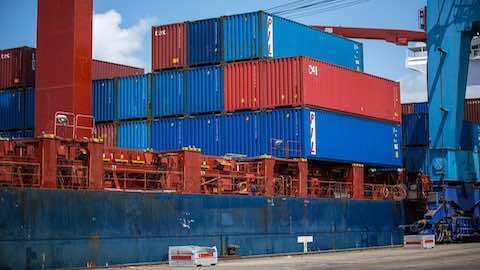 Economy: "Forming an Alliance Against Bad Chinese Trade Practices Won't Be Enough"